Everyone knows the Château Frontenac and its famous Dufferin Terrace, with its panoramic view of the river and the city of Lévis. But many tourists don't know that Old Quebec, which is easily explored on foot, offers dozens of major historical sites, including the Quebec Seminary and the Museum of French America, rue Petit Champlain and its numerous boutiques, Place Royale and Notre-Dame-des-Victoires Church, the Museum of Civilization, and St. Andrew's Presbyterian Church. 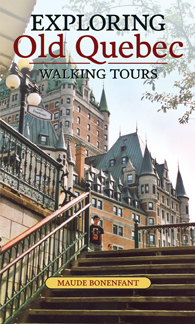 Exploring Old Quebec offers 129 attractions, arranged into seven walking tours. The guide also presents four thematic itineraries: religious heritage, the anglophone presence in Quebec City, arts and literature, and the presence of the First Nations. Exploring Old Quebec contains everything you need to discover this unique city that will be celebrating its 400th anniversary in 2008. Maude Bonenfant is a Ph.D. student in semiology at the Université du Québec à Montréal. In her free time, she loves to travel and has visited many of the world s great cities. She has a soft spot for Quebec City, and has visited often. 120 pp 7" x 4.25"